It’s Sunday; the Giants are beating the Padres in AT&T Park, it’s Earth Day, all is right in the world so we make a light-duty post just to keep the streak alive. We’ve extolled the virtues of staff photographer Lo Phat. Here is a shot he took over the back fence of the Ol’ Reno Guy global headquarters onto Allen Street, a dead bird under tow from a ’57 Chevy tow truck. 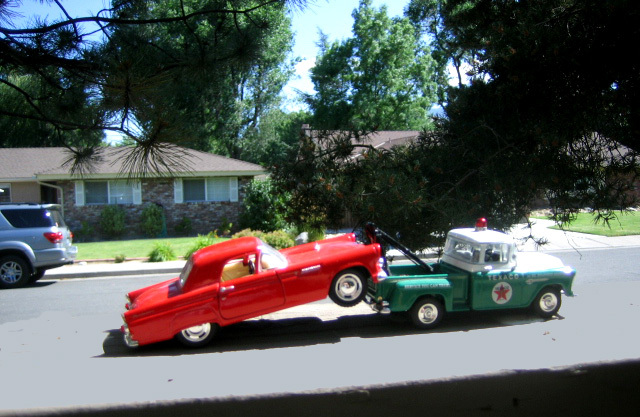 Actually, the T-Bird and the tow truck are each about four inches long, seen sitting on top of the fence, and now back in their place in the cabinet in the headquarter building. 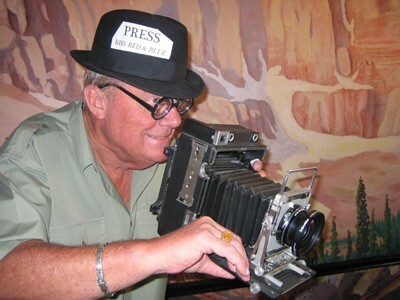 How does he do it, with that old pre-war Speed Graphic?